Braamfontein Alive: Life lesson from General Idi Amin. Life lesson from General Idi Amin. In 1972, General Idi Amin, the Head of State of Uganda, ordered the 80,000 South Asians living in his country to leave, they had 90 days to comply and could only take $50 out of Uganda. Of the 80,000 Asians ordered to leave Uganda, 23,000 were Ugandan citizens whose parents had lived in the country even before Uganda became a nation. Indians first moved to Uganda in the 1890s to work in large railway and infrastructure projects. By the 1970s, they were leading in business and commerce. Before the expulsion, Asians owned many large businesses in Uganda. A BBC News report posted that the Indians owned 90% of Uganda businesses and accounted for 90% of Uganda's tax revenues. 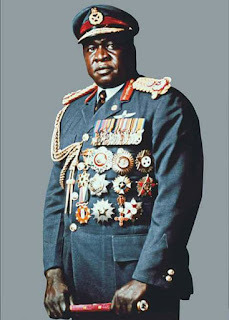 Why did Idi Amin expel 50,000 Asians that gave him 90% of tax revenues? It was in effect a money grab by Idi Amin, according to a book by Jan Jorgensen titled Uganda : A Modern History, about 5,655 individual firms, ranches, farms, and agricultural estates even cars and televisions were reallocated by Idi Amin to selected beneficiaries, mostly individuals who whose only qualification to "inherit" these business was that they were Ugandan and friends of Idi Amin. This was an eradication of the Ugandan economic middle-class, with the express intent to seizure and transfer their wealth. So the Asians left Uganda, most moved to the UK, some to Canada, US, West Germany, it was an exodus. What was Uganda loss became the gain of the nations that accepted the Asians. In 2012, David Cameron the British PM called the Asians from Uganda “one of the most successful groups of immigrants anywhere in the history of the world”, why? because they prospered and paid taxes in the UK. "The Ugandan economy was devastated by Amin’s expulsion of the Asian community........The real value of salaries and wages fall by 90% in less than a decade. ........In retrospect, the expulsion put an end to Uganda's post-independence prosperity.....Investments dried up, exports declined, and per capita incomes fell continuously from 1973 (Asians expelled in 1972). 3. The manner in which former Asian businesses were acquired created insecurity of tenure, leading to asset stripping. in summary, the expulsion of the Asians from Uganda was an economic disaster. in 1985, President Yoweri Museveni, asked the Asian exiles to return to Uganda, some have. Now despite making up less than 1% of the population, the Asians are now estimated to contribute up to 65% of Uganda's tax revenues, in fact Uganda richest man, Sudhir Ruperalia, is an Asian. So the plan by Idi Amin to redistribute Asian property to Ugandan backfired, and today the Uganda economy is back in Asian hands. Collective wealth it seems is created organically, deliberately and strategically. its cannot be expropriated from one group of citizens and handed over to different group of citizens.....no. Those who fail to learn from history are inclined to repeat it.